Benign Positional Paroxysmal Vertigo (BPPV) is caused by the presence of canaliths in the semi-circular canal instead of the utricle. Once in the canal, movement of the patient’s head will result movement of these crystals that cause an abnormal movement of endolymph, resulting in vertigo. BPPV can occur in patients following a head injury, previous history of labyrinthitis, and older patients. In BPPV, vertigo attacks last seconds and result from the same head movement causing the onset of symptoms every time. Accompanying symptoms typically include nausea and vomiting. The diagnostic examination for BPPV is the Dix-Hallpike manoeuvre, with a positive test invoking the symptoms and nystagmus* will be present. The nystagmus fatigues in less than a minute. Once the condition is diagnosed, specific manoeuvres can be employed to remove the crystals from the canal and resolve the symptoms. A common manoeuvre is Epley’s Manoeuvre, performed if the canalith are in the posterior canal. Patients post-Epley’s manoeuvre are advised not to drive, to keep sleep upright, not to bend down or look upwards for 48 hours. Resolution is not always complete, with some patients requiring repeated Epley’s as symptoms persist, and BPPV can also recur. Patients can also be advised to perform Brandt-Daroff exercises, positions they can practice at home that are beneficial in reducing symptom intensity. *Most commonly crystals form in the posterior canal, resulting in a rotatory nystagmus to be present; if in the horizontal canal then result in a horizontal nystagmus. Meniere’s Disease is an idiopathic disorder causing vertigo. Current theories in its pathophysiology suggest the symptoms result from an increase in endolymphatic pressure. Caused by dysfunctioning sodium channels, an osmotic gradient is subsequently set up that draws fluid into the endolymph, increasing the endolymphatic pressure to cause symptoms. Meniere’s disease presents with attacks comprised of a triad of severe paroxysmal vertigo, sensorineural hearing loss, and tinnitus. Symptoms are predominantly unilateral, lasting for minutes to hours, and usually resolve within 24 hours. During remission between attacks, the symptoms will improve yet repeated attacks result in a sensorineural hearing loss that worsens over time. Whilst the disease will burn out eventually with time, permanent sensorineural hearing loss can remain. 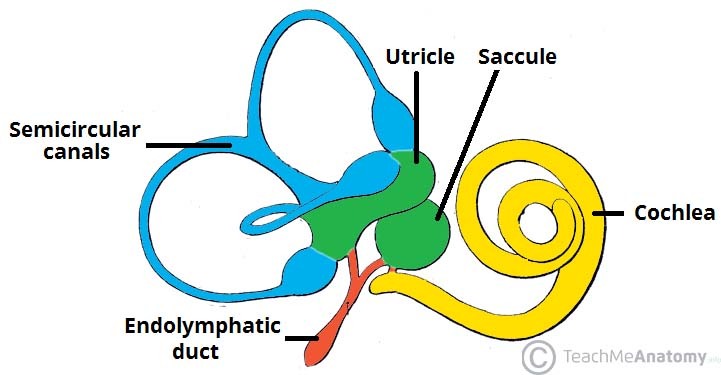 Otoscopy will show a normal looking ear drum, audiometry will typically show a sensorineural hearing loss, and tympanometry will be type A (normal). In acute attacks, the vertigo and nausea symptoms can be reduced by a short course of prochlorperazine (a vestibular sedative), given either buccal or intramuscular. Most importantly however, management requires sufficient prophylaxis between attacks. Patients should be advised suitable lifestyle advice (reducing salt or avoiding chocolate and caffeine) and regular betahistine medication. If attacks persist despite prophylaxis, surgical intervention may be warranted. This can include intratympanic gentamicin injections, intratympanic steroid injections, endolymphatic sac destruction, or labyrinthectomy (now rarely performed). Vestibular neuronitis is inflammation of the vestibular nerve, resulting in vertigo that lasts for days. Most cases are due to a viral infection, therefore a URTI precedes around half of the cases. Symptoms will be sudden onset and severely incapacitating, nearly always associated with nausea and vomiting. On otoscopy, the ear drum will be normal and a horizontal nystagmus will be present when examining the eyes. Neurological examination will be unremarkable and the hearing for these patients will be normal. Whilst most cases resolve fully within a week; long-term vestibular deficit after the acute episode can lead to unsteadiness over a period of weeks whilst the brain compensates for this. Most patients can be managed at home. During the acute episode, a patient may require vestibular sedatives (to be stopped after the acute episode), also considering intravenous fluids if the patient becomes dehydrated from vomiting. If there are persistent problems due to vestibular hypofunction, then the patient may require longer term vestibular rehabilitation via Cawthorne-Cooksey exercises. Which of the following is not a central cause of vertigo? What manoeuvre can be employed to assess for potential canalith in the posterior canal?